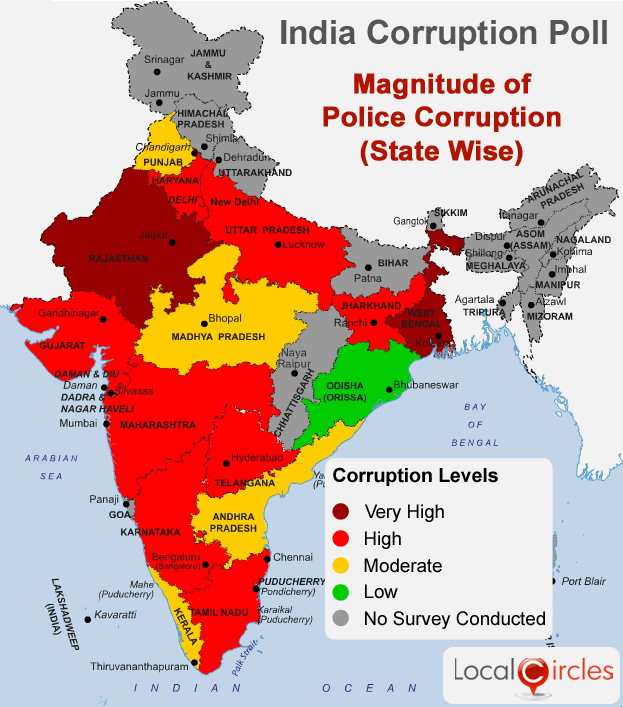 Various polls were carried out at national and state levels to understand how common place is bribery, what are the areas where citizens struggle the most, which local bodies are involved in corruption most frequently and which states are taking steps to reduce corruption. 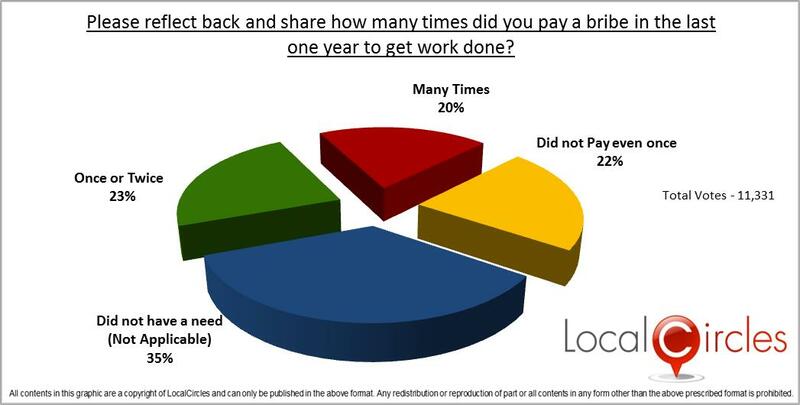 In the national survey, interestingly, a large per cent 43 % citizens claimed they paid a bribe to get something done in the last one year, of this 20 % claimed they have paid bribes many times during the year. While 22 % claimed they did not pay even once and 35 % admitted they had no need for paying a bribe. Bribe giving and taking both is considered a crime in the country. To understand the root cause of this corruption, LocalCircles asked citizens where did they pay this bribe. 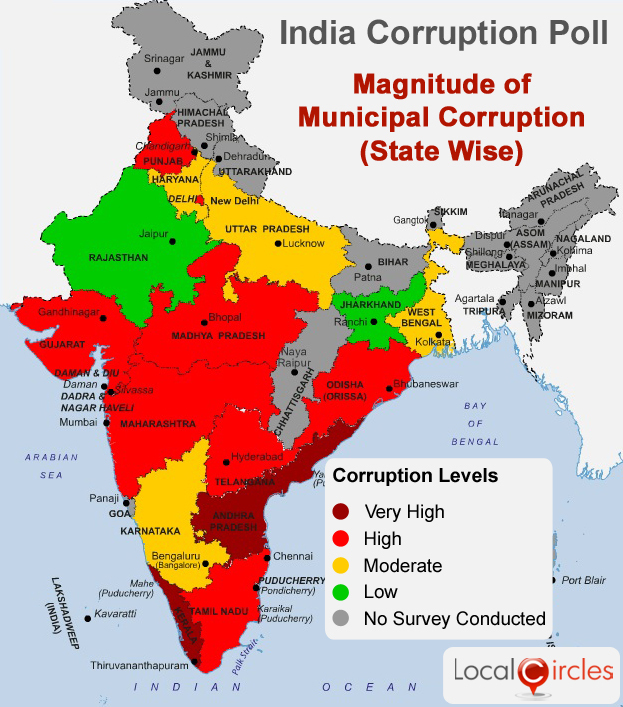 Around 32 % said that the bribes were demanded from Municipal Corporation or its staff, another 31 % said the local police or traffic police demanded bribes. Another 31% said bribe was demanded for property registration, vehicle registration, in local tax related matters and other Government offices. Approximately 6% said they had to pay a bribe related to power or electricity connection. Citizens were also asked if corruption has reduced in state and local administration as most citizens have dealings with these entities. Around 49 % citizens polled said that there has been no such reduction. 51% believed that there was some reduction in corruption than before. The issue of agents and corruption inextricably linked and 25 % of the citizens said that they paid bribe through an agent while 26% said they paid it directly and in cash. Bribes continue to be part of the cash economy. One of the question asked was whether their state government has introduced any systems or processes to reduce corruption in the state. The consolidated finding of this answer is presented in the report below. 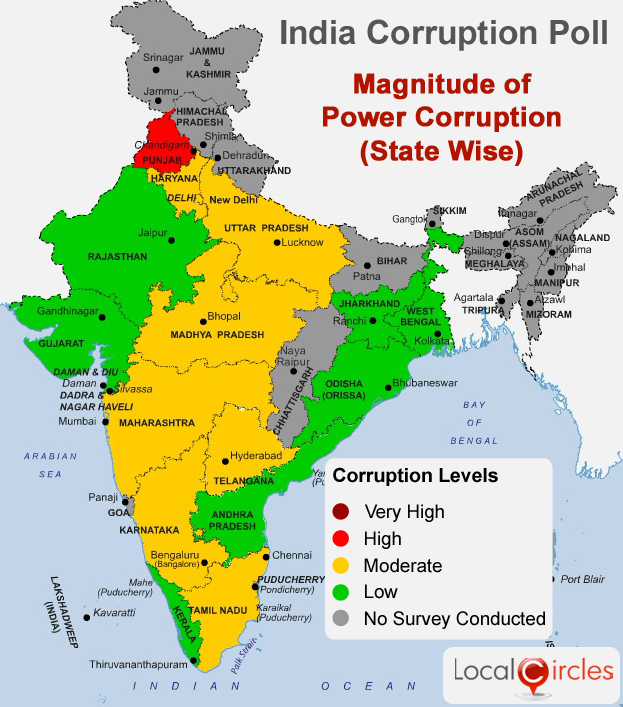 It shows that citizens believe that states like Rajasthan, Punjab, Bihar, Madhya Pradesh, Orissa, Jharkhand and Uttrakhand have taken no measures to introduce any systems or processes to reduce corruption. 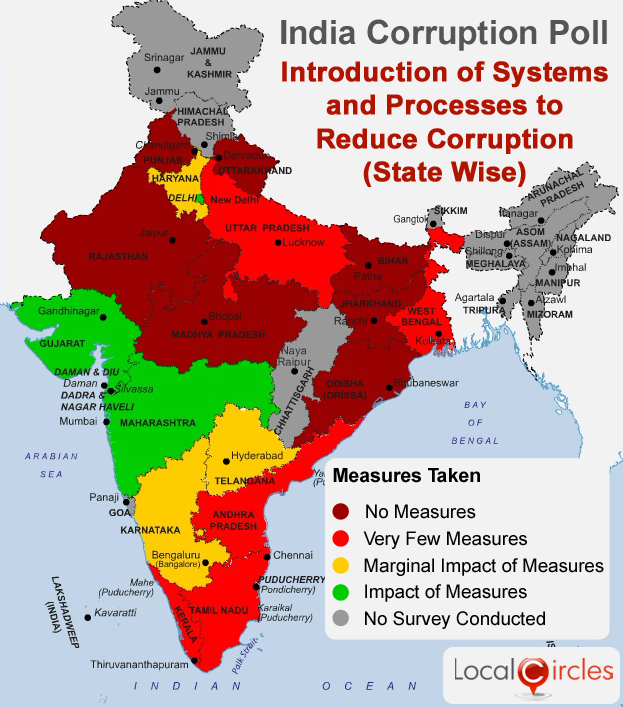 Other states have taken some measures to improve transparency, however the only states where there are some visible results are Gujarat, Delhi and Maharashtra. 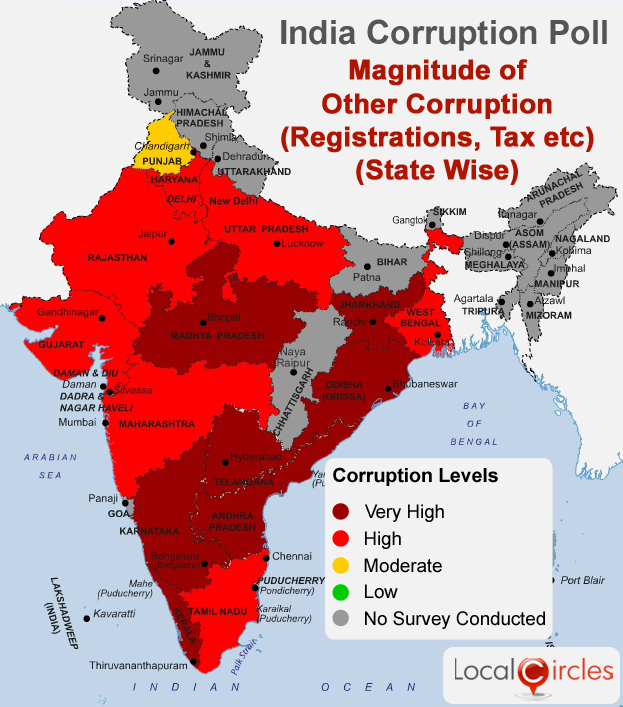 The silver lining in the survey however is that 68% citizens believe that corruption will reduce in India in the next 5 years as use of technology, social media and participative governance models increase. Over 15,000 citizens across India participated from 56 cities in these polls with 70% male participants and 30% female participants. Given below are the detailed results of the national and state level polls. The survey was conducted via the platform localcircles.com which is accessed through computers and smart phones. Hence, the participation in the survey is limited to those having internet access. 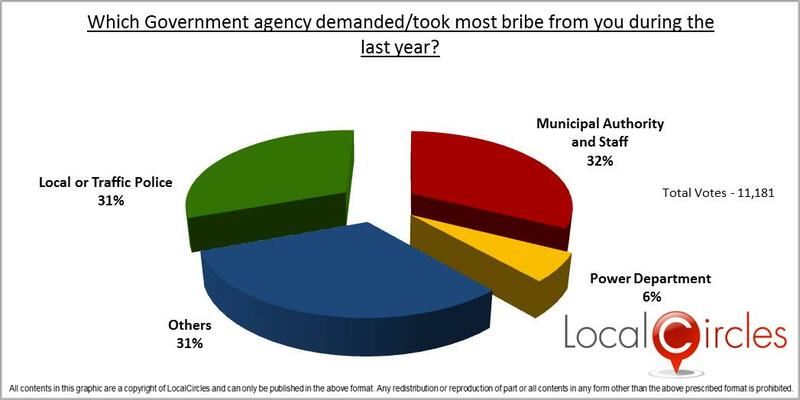 Poll 1: How common was bribery in the last year? Poll 2: Which Government agency took most bribe? 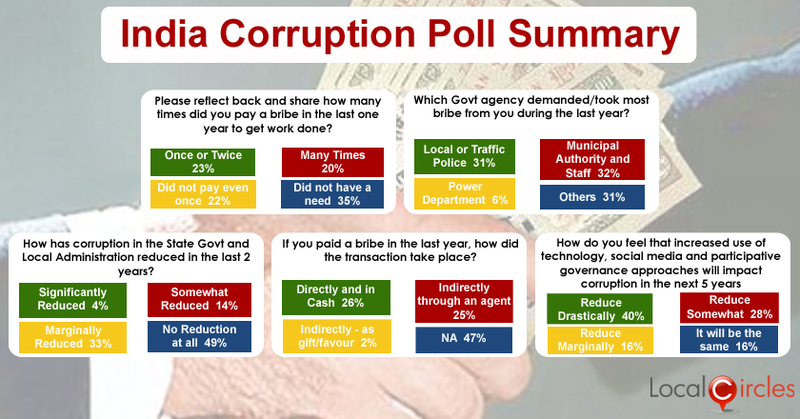 Poll 3: Has corruption reduced? Poll 4: How did the transaction take place? Poll 5: Will corruption reduce in the coming years?